A banned motorist has been jailed after he was twice caught behind the wheel of two different vehicles during the same month. Chesterfield magistrates’ court heard on November 22 how Szymon Pawel Lampart, 27, was first caught driving a Jaguar while disqualified on the A38 in Derby and eight days later he was caught driving an Audi on the A38 at Swanwick. Prosecuting solicitor Becky Allsop told a previous hearing: “Lampart was disqualified under the totting-up provisions in the Humber area where he lives. Lampart was also seen driving again on November 21, according to Mrs Allsop, and he was recognised by the same officer who had stopped him previously and on this second occasion he was driving an Audi A3. The defendant was also found to have cannabis with him during the second incident. 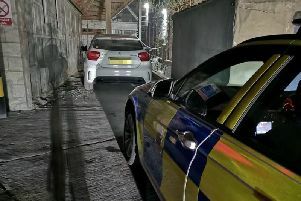 He told police he had bought the Audi A3 on November 19 because police had seized the Jaguar and he said he was driving from Hull to Burton-on-Trent and needed to travel to see his son. Lampart, of Ilthorpe, Kingston-Upon-Hull, pleaded guilty to two counts of driving while disqualified and to two counts of driving without insurance. He also admitted possessing cannabis and to breaching a conditional discharge previously imposed for possessing cannabis. Defence solicitor Rob Sowter said Lampart is Polish and has lived in the UK for approximately ten years and he works at a car-wash.
Mr Sowter added that Lampart wanted to comply with the probation service to avoid a custodial sentence. But the defendant was sentenced to 16 weeks of custody and was ordered to pay a £115 victim surcharge. He was also further disqualified from driving for two years and 56 days.